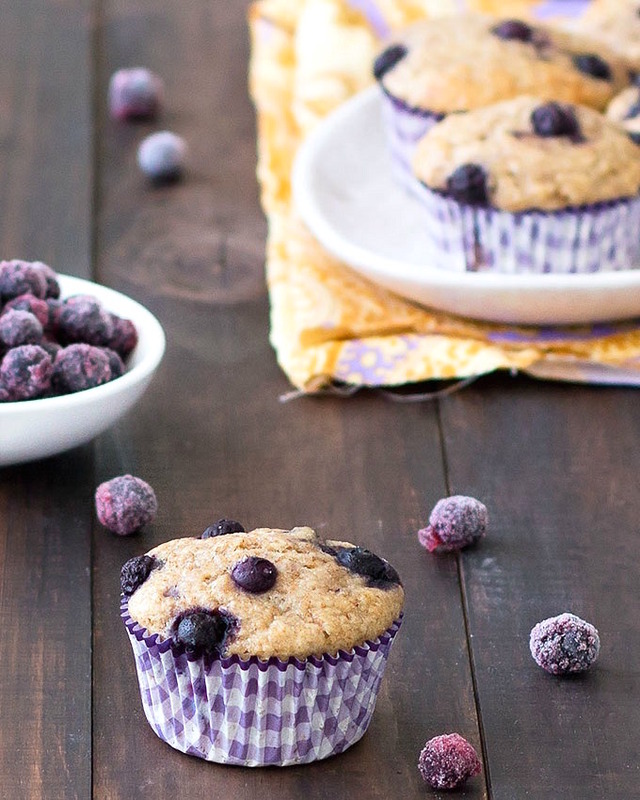 These skinny banana blueberry muffins are full of healthy ingredients with no oil, butter, or refined sugar! 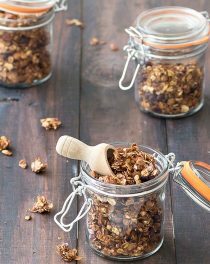 They are perfect for breakfast or as a midday snack. I started with my lemon poppy seed muffins recipe and made some modifications to create healthier muffins. The result is delicious, tender and soft muffins, it’s almost impossible to believe they have only 159 calories and 1.1 grams of fat per serving. Greek yogurt and mashed banana replace the oil adding moisture. Then I used half cake flour and half whole wheat flour. 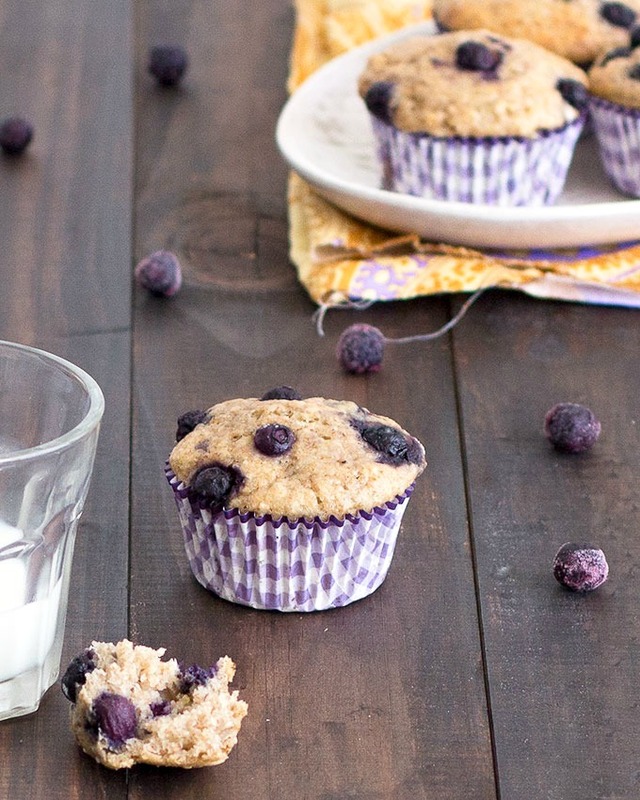 The cake flour makes the muffins super soft, the whole wheat flour add extra fiber. If you don’t have cake flour you can make it (check this tutorial by Joy the Baker) or use all-purpose flour. Finally, I used brown sugar and honey in place of granulated white sugar. I prefer frozen blueberries, but you could easily use fresh. Don’t thaw frozen blueberries, just add them still frozen to the other ingredients, this will prevent them from dying your whole batter blue. The recipe is quick and easy but remember not to over mix the batter otherwise you will end up with dense muffins. When you combine the dry ingredients with the wet ones it’s ok to have some lumps. Don’t use muffin liners, the lack of oil will make the muffins stick to the liners. 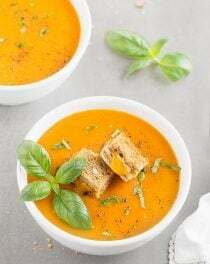 Store them in an airtight container for up to 3 days or freeze for up to a month. To defrost, put the muffin in the microwave for 30 seconds and you are good to go! 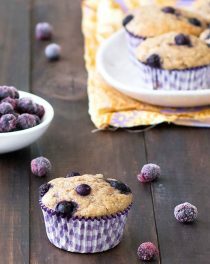 If you are looking for a healthy breakfast treat, give these skinny banana blueberry muffins a try. They are a keeper in my house! Preheat the oven to 180 degrees C (375 degrees F). Grease a 12-cup muffin tin by brushing the bottoms and sides with softened butter, oil or spraying them with nonstick cooking spray. 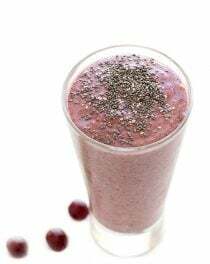 Toss the blueberries in a tablespoon of flour and set aside. In a large bowl, combine the flours, sugar, baking powder, baking soda, lemon zest and salt. In a separate bowl combine the mashed bananas, Greek yogurt, honey, milk, eggs, and whisk together until well mixed. Add the wet ingredients to dry ingredients and stir until just combined. Then add the blueberries and stir again, very carefully and quickly so the blueberries don’t break. Scoop into a prepared muffin tin with a large ice cream scoop. If you wish, you can place a a few extra blueberries on top. 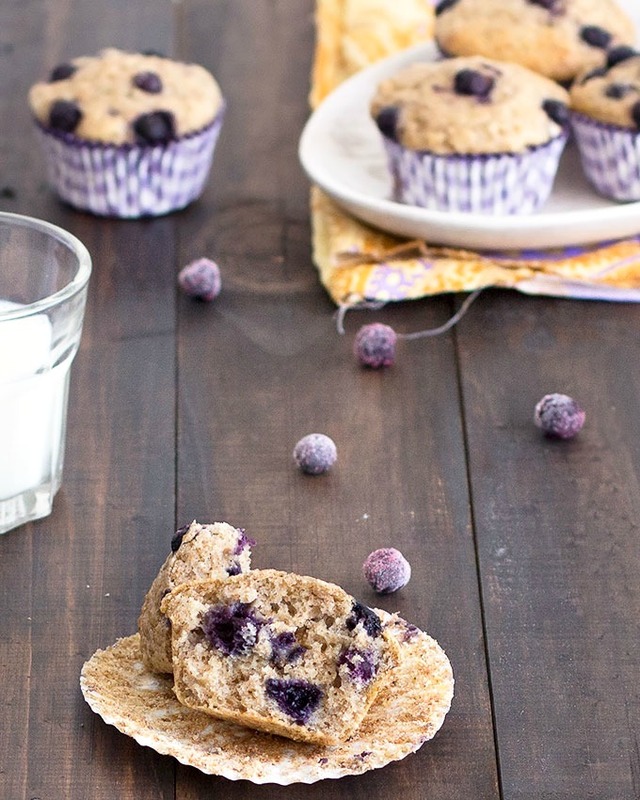 Enjoy these skinny banana blueberry muffins! Don't use muffin liners, the lack of oil will make the muffins stick to the liners. these look so good! Can’t wait to try them! I’ve just made these as well as the chocolate cake from your website, both of them came out perfect!! I am so glad you like my recipes, Katie! 🙂 Thank you for your feedback.